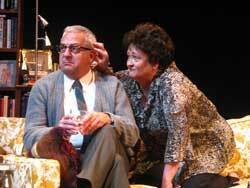 Company of Fools presents Edward Albee's "Who's Afraid of Virginia Woolf?" at the Liberty Theatre in Hailey tonight and Thursday at 7 p.m. The final show is Saturday at 8 p.m. Tickets are $28 for adults, $20 seniors and $10 students. For details, call 578-9122. The Sun Valley Center for the Arts will present a two-day seminar, "How to Thrive and Not Merely Survive as a Studio Professional," on Saturday, Nov. 6, and Sunday, Nov. 7, from 9 a.m. to noon and from 1-4 p.m. each day for artists who show their work at juried festivals. The cost for the seminar is $125 for both days or $75 for a single day. To register, visit www.sunvalleycenter.org or call 726-9491. The Hemingway Elementary School Bookfair will take place Tuesday, Nov. 2, through Friday, Nov. 5 in the school foyer in Ketchum. Hours for the fair are Tuesday through Thursday 7:30 a.m. to 6 p.m. and Friday 7:30 a.m. to 1 p.m. For details, e-mail rico.amy@cox.net. Idaho's Bounty will hold its annual fundraiser and local food fair at Elkhorn Springs Restaurant in Sun Valley on Thursday, Nov. 4, from 4-9 p.m. Advance tickets are $30, children 12 and under attend for $10 and children 3 get in free. Tickets are available online at www.idahosbounty.org or at Nourish Me in Ketchum. Tickets at the door cost $35. For details, e-mail jaugustus@idahosbounty.org or call 721-1412.